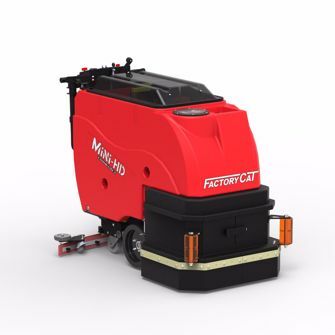 Heavy duty and productive best describe the Factory Cat Mini-HD walk behind floor scrubber. These industrial walk behind scrubbers are made in America in Racine Wisconsin, and are designed to work in the toughest environments. The heavy duty front bumpers give added protection to the beefed up scrub head. The Mini-HD can be set up with disc, or cylindrical scrub heads, in sizes ranging from 25” to 29” for maximum versatility. The Disk model offers a gimbaled brush drive and 35% more scrubbing power. The Cylindrical unit reduces or eliminates dust mopping by sweeping and scrubbing in a single pass. The large clean water tanks extend run time between refills. The waste water tank is completely accessible for easy clean out and comes with a removable debris basket that is a real drain saver. The Mini-HD has a powerful, sealed transaxle for climbing steep ramps and heavy duty tires to withstand harsh chemicals. The four point stance and oversized wheels allow it to remain stable over rough terrain.